A blender is a kitchen and laboratory tool used to mix, puree, or emulsify food and other substances. A stationary blender consists of a blender jar with a rotating metal blade at the bottom, powered by an electric motor in the base, an immersion blender has a motor on top connected by a shaft to a rotating blade at the bottom/ The immersion blender can be used with any container. For a blender to be effective the particles must be small enough so that the mixture will flow. The first step of a blender is therefore cutting, smashing, chopping. The second step is the food must begin to flow. Since it takes a lot of kinetic energy to break pieces down very small, the final size in this step depends on the power of the blender. A lot of the kinetic energy from the fast-spinning blades will cause the temperature of the mixture in the blender to rise through friction. At this point and another set of forces (See What is Cavitation, below) take over. A combination of compressive shearing forces and cavitation that causes the blender to rip pieces of food into bits so small that the end result is a smooth puree or a rich emulsion. "A powerful shearing force drives circulation by sucking liquid down from the top of the pitcher and then violently flinging it out to the sides. This motion creates large shear stresses, which help break up the food, you will also see tiny bubbles spinning off the blades. These bubbles, formed by the pressure drop of fluid accelerated over the arms of the blades, are the cavitation bubbles. When they collapse, or implode, they create localized shock waves that further break up the blender’s contents". What is Cavitation in a Blender? Cavitation is the formation of vapor cavities in a liquid – i.e. small liquid-cavitation-free zones ("bubbles" or "voids") – that are the consequence of cavitational forces acting upon the cavitational liquid. It usually occurs when a liquid is subjected to rapid changes of pressure that cause the formation of cavities in a region of low pressure. The bubbles, formed by the pressure drop of fluid accelerated over the arms of the blades, are cavitation bubbles. The physical process of cavitation inception is similar to boiling. When subjected to higher pressure, the voids implode and can generate an intense shockwave. Cavitation occurs when the local pressure in a liquid drops below the vapor pressure of the liquid, causing the liquid to boil. A common situation where this can occur is in flow around propeller blades. As a liquid is accelerated over propeller blades, the fluid pressure decreases in response to the increase in fluid velocity (according to a relationship known as Bernoulli's principle). If the flow reaches a high enough velocity, the pressure can be reduced enough to cause cavitation. Bubbles that form as a result of cavitation have a much lower density than the surrounding liquid and the ability of the propeller to generate thrust suffers. Additionally, when the bubbles move to regions of higher fluid pressure, they will collapse and the force of collapse can damage the propeller surface. Cavitation is very powerful. Just a few imploding bubbles can cause glass to shatter. For that reason newer more powerful blenders no longer use glass for the container. See the video above that shows this effect. While cavitation allows for formation of that smooth emulsion there is a downside. Cavitation also results in aeration of the food in the container which increases the rate of oxidation..This oxidation can cause the breakdown in enzymes food and thereby decrease the nutrition value. So the less cavitation the better. 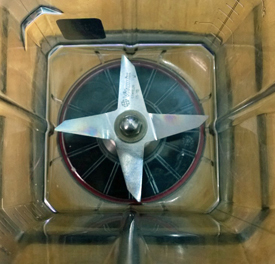 Some blenders such as Vitamix can help prevent air pockets by using the accompanying tamper. In many blenders it may be necessary to turn them off and either shake the container or manually remove the air pocket with a spoon before turning the blender on again. The Vitamix tamper allows you to do this while the blender is running. You can also prvent cavitation by adding more liquid. An immersion blender, or stick blender is a kitchen appliance to blend ingredients or puree food in the container in which they are being prepared. They may be used for pureeing soups and emulsifying sauces. Some can be used while a pan is on the stove. Immersion blenders are distinguished from blenders and food processors that require food be placed in a special vessel for processing. They are distinguished from hand mixers which do not chop the food as it is blended. One purpose that immersion blenders can be used when regular blender fail is making foam that is used in many Modernist Cuisine recipes. By holding the immersion blender just at the surface of the liquid (or at an angle as shown in the above video) air bubbles will form in a liquid that contains an emulsifier such as lecithin. -- See video below. The immersion blender is in the horizontal position allowing the maximum amount of air to be incorporated into the foam. The recipe is for a lemon foam that uses lecithin.